‘Imād ad-Dīn Muḥammad bin Qāsim ath-Thaqafī (Arabic: عماد الدين محمد بن القاسم الثقفي‎; c. 695 – 715) was an Umayyad general who conquered the Sindh till Multan along the Indus River and then controlled for a short period of 4 years for the Umayyad Caliphate. He was born and raised in the city of Ta'if (in modern-day Saudi Arabia). Qasim's conquest of Sindh up to southern-most parts of Multan enabled further Muslim conquests on the Indian subcontinent. Due to his close relationship with Al-Hajjaj, Bin Qasim was executed after the accession of Caliph Sulayman ibn Abd al-Malik. According to Berzin, Umayyad interest in the region occurred because of attacks from Sindh Raja Dahir on ships of Muslims and their imprisonment of Muslim men and women. [not in citation given] They had earlier unsuccessfully sought to gain control of the route, via the Khyber Pass, from the Kabul Shahi of Gandhara. But by taking Sindh, Gandhara's southern neighbour, they were able to open a second front against Gandhara; a feat they had, on one occasion, attempted before. The Umayyad Caliphate on the eve of the invasions of Spain and Sindh in 710. These Arabs were imprisoned later on by the Governor Deebal Partaab Raye. A letter written by an Arab girl named Nahed who escaped from the prison of Partab Raye asked Hajjaj Bin Yusuf for help. When Hajjaj asked Dahir for the release of prisoners and compensation, the latter refused on the ground that he had no control over those. Al-Hajjaj sent Muhammad Bin Qasim for action against the Sindh in 711. The mawali; new non-Arab converts; who were usually allied with Al-Hajjaj's political opponents and thus were frequently forced to participate in battles on the frontier of the Umayyad Caliphate — such as Kabul, Sindh and Transoxania. An actual push into the region had been out of favor as an Arab policy since the time of the Rashidun Caliph Umar bin Khattab, who upon receipt of reports of it being an inhospitable and poor land, had stopped further expeditionary ventures into the region. 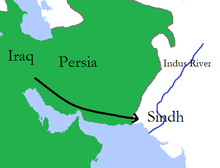 A map of Muhammad bin Qasim's expedition into Sindh in 711 AD. Hajjaj had put more care and planning into this campaign than the second campaign  under Badil bin Tuhfa. Hajjaj superintended this campaign from Kufa by maintaining close contact with Muhammad bin Qasim in the form of regular reports for which purpose special messengers were deputed between Basra and Sindh. The army which departed from Shiraz in 710 CE under Muhammad bin Qasim was 6,000 Syrian cavalry and detachments of mawali from Iraq. At the borders of Sindh he was joined by an advance guard and six thousand camel riders and later reinforcements from the governor of Makran transferred directly to Debal by sea along with five catapults ("manjaniks"). The army that eventually captured Sindh would later be swelled by the Gurjars and Meds as well as other irregulars that heard of successes in Sindh. When Muhammad bin Qasim passed through Makran while raising forces, he had to re-subdue the restive Umayyad towns of Fannazbur and Arman Belah (Lasbela) The first town assaulted was Debal and upon the orders of Al-Hajjaj, he exacted a bloody retribution on Debal by giving no quarter to its residents or priests and destroying its great temple. Extent and expansion of Umayyad rule under Muhammad bin Qasim in medieval India (modern international boundaries shown in red). From Debal the Arab army then marched north taking towns such as Nerun and Sadusan (Sehwan) peacefully. often using their components; additionally one-fifth of the booty including slaves were dispatched to Hajjaj and the Caliph. The conquest of these towns was accomplished easily; however, Raja Dahir's armies being prepared on the other side of the Indus were yet to be fought. In preparation to meet them, Muhammad bin Qasim moved back to Nerun to resupply and receive reinforcements sent by Hajjaj. Camped on the east bank of the Indus, Qasim sent emissaries and bargained with the river Jats and boatmen. Upon securing the aid of Mokah Basayah, "the King of the island of Bet", Muhammad bin Qasim crossed over the river where he was joined by the forces of the Thakore of Bhatta and the western Jats. The conquest of Sindh, in modern-day Pakistan, although costly, was major gain for the Umayyad Caliphate. However, further gains were halted by Hindu kingdoms during the Caliphate campaigns in India. The Arabs tried to invade India but they were defeated by the north Indian king Nagabhata of the Gurjara Pratihara Dynasty and by the south Indian Emperor Vikramaditya II of the Chalukya dynasty in the early 8th century. After the failure of further expeditions on Kathiawar, the Arab chroniclers admit that the Caliph Mahdi "gave up the project of conquering any part of India." The Arabs' first concern was to facilitate the conquest of Sindh with the fewest casualties while also trying to preserve the economic infrastructure. Towns were given two options: submit to Islamic authority peacefully or be attacked by force (anwattan), with the choice governing their treatment upon capture. The capture of towns was usually accomplished by means of a treaty with a party from among the enemy, who were then extended special privileges and material rewards. There were two types of such treaties, "Sulh" or "ahd-e-wasiq (capitulation)" and "aman (surrender/ peace)". Among towns and fortresses that were captured through force of arms, Muhammad bin Qasim performed executions of ahl-i-harb (fighting men) as part of his military strategy, whose surviving dependents were enslaved. Where resistance was strong, prolonged and intensive, often resulting in considerable Arab casualties, Muhammad bin Qasim's response was dramatic, inflicting 6,000 deaths at Rawar, between 6,000 and 26,000 at Brahmanabad, 4,000 at Iskalandah and 6,000 at Multan. Conversely, in areas taken by sulh, such as Armabil, Nirun, and Aror, resistance was light and few casualties occurred. Sulh appeared to be Muhammad bin Qasim's preferred mode of conquest, the method used for more than 60% of the towns and tribes recorded by Baladhuri and the Chach Nama. At one point, he was actually berated by Al-Hajjaj for being too lenient. Meanwhile, the common folk were often pardoned and encouraged to continue working; Al-Hajjaj ordered that this option not be granted to any inhabitant of Debal, yet Qasim still bestowed it upon certain groups and individuals. Muhammad bin Qasim's success has been partly ascribed to Dahir being an unpopular Hindu king ruling over a Buddhist majority who saw Chach of Alor and his kin as usurpers of the Rai Dynasty. This is attributed to having resulted in support being provided by Buddhists and inclusion of rebel soldiers serving as valuable infantry in his cavalry-heavy force from the Jat and Meds. Brahman, Buddhist, Greek, and Arab testimony however can be found that attests towards amicable relations between the adherents of the two religions up to the 7th century. Superior military equipment; such as siege engines and the Mongol bow. The concept of Jihad as a morale booster. Religion; the widespread belief in the prophecy of Muslim success. The Samanis being persuaded to submit and not take up arms because the majority of the population was Buddhist who were dissatisfied with their rulers, who were Hindu. The laboring under disabilities of the Lohana Jats. Defections from among Dahirs chiefs and nobles. Everywhere taxes (mal) and tribute (kharaj) were settled and hostages taken — occasionally this also meant the custodians of temples. Non-Muslim natives were excused from military service and from payment of the religiously mandated tax system levied upon Muslims called Zakat, the tax system levied upon them instead was the jizya - a progressive tax, being heavier on the upper classes and light for the poor. In addition, three percent of government revenue was allocated to the Brahmins. During his administration, Hindus and Buddhists were inducted into the administration as trusted advisors and governors. A Hindu, Kaksa, was at one point the second most important member of his administration. Dahir's prime minister and various chieftains were also incorporated into the administration. Significant medieval Muslim chronicles such as the Chachnama, Zainul-Akhbar and Tarikh-I-Baihaqi have recorded battles between the Jats and forces of Muhammad bin Qasim . Historians such as Elliot, Cousens, Majumdar and Vaidya, have the general consensus that there was coercive conversion during the reign of Muhammad the Qasim, and destruction of temples was a reflection of the more basic, religiously motivated intolerance, facts also corroborated by various islamic sources such as Chachnama, Zainul-Akhbar and Tarikh-I-Baihaqi. Lane-Poole writes that, "as a rule Muslim government was at once tolerant and economic". The preference of collection of jizya over the conversion to Islam is a major economic motivator. Hindus and Buddhists who were classified as Dhimmis had to pay mandatory Jizya, a form of ransom money. Jizya is normally higher than the zakat to be paid by muslims. Contrastingly preferential treatment was given to a small number of people who were converted to Islam by "exempting them from Jizya in lieu of paying the Zakat". Qasim fixed Zakat at 10% of the agricultural produce. Dhimmis, who are given a second-class status and often treated harshly, have to pay the mandatory jizya. Dhimmis have to endure more restrictions and lesser rights than muslims. In Al-Biruni's narrative, according to Manan Ahmed Asif – a historian of Islam in South and Southeast Asia, "Qasim first asserts the superiority of Islam over the polytheists by committing a taboo (killing a cow) and publicly soiling the idol (giving the cow meat as an offering)" before allowing the temple to continue as a place of worship. A religious islamic office, "sadru-I-Islam al affal", was created to oversee the secular governors. The native heriditary elites were reappointed with the title of rana. According to Yohanan Friedmann, Qasim declared that the Brahmins of Brahmanabad were good people. While proselytization occurred, given the social dynamics of areas of Sindh conquered by Muslim, the spread of Islam was slow and took centuries. No mass conversions to islam took place and some temples escaped destruction such as the Sun Temple of Multan on payment of jizya. In the Arab settlers controlled areas of Sindh and Multan, conversion to Islam occurred only slowly, not on a massive scale. Majority of the population continued to remain Hindu who had to pay the jizya imposed by the Muslim state. Muhammad bin Qasim had begun preparations for further expansions when Hajjaj died, as did Caliph Al-Walid I, who was succeeded by Sulayman ibn Abd al-Malik, who then took revenge against all who had been close to Hajjaj. Sulayman owed political support to opponents of Hajjaj and so recalled both of Hajjaj's successful generals Qutaibah bin Muslim and Qasim. He also appointed Yazid ibn al-Muhllab, once tortured by Hajjaj and a son of Al Muhllab ibn Abi Suffrah, as the governor of Fars, Kirman, Makran, and Sindh; he immediately placed Qasim in chains. According to Al-Baladhuri, a 9th-century historian, Qasim was killed due to a family feud with the governor of Iraq. After the death of the caliph Al-Walid I, his brother Sulayman ibn Abd al-Malik became the new caliph. Sulayman became hostile against Qasim because apparently he had followed the order of Hajjaj to declare Sulayman's right of succession void in all territories conquered by him. When Qasim received the news of the death of Hajjaj he returned to Aror. Qasim was later arrested under the orders of the caliph by the successor governor of Sindh, Yazid ibn Kabsha as-Sasaki, who worked under the new governor of Iraq, Yazid ibn al-Muhallab, and the new fiscal manager, Salih ibn Abd ar-Rahman. Salih, whose brother was executed by Hajjaj, tortured Qasim and his relatives to death. The account of his death by Al-Baladhuri is very brief compared to the one in Chachanama. The Chachnama narrates a tale in which Qasim's demise is attributed to the daughters of King Dahir who had been taken captive during the campaign. Upon capture they had been sent on as presents to the Khalifa for his harem in the capital Baghdad (however Baghdad wasn't built yet and the actual capital was Damascus). The account relates that they then tricked the caliph into believing that Muhammad bin Qasim had violated them before sending them on and as a result of this subterfuge, Muhammad bin Qasim was wrapped and stitched in oxen hides, and returned to Syria, which resulted in his death en route from suffocation. This narrative attributes their motive for this subterfuge to securing vengeance for their father's death. Upon discovering this subterfuge, the Khalifa is recorded to have been filled with remorse and ordered the sisters buried alive in a wall. His conquest, as described by Stanley Lane-Poole, in Medieval India (Published in 1970 by Haskell House Publishers Ltd), was "liberal". He imposed the customary poll tax, took hostages for good conduct and spared peoples' lives and lands. He even left their shrines undesecrated: 'The temples;' he proclaimed, 'shall be inviolate, like the churches of the Christians, the synagogues of the Jews and altars of the Magians'. In the same text, however, it is mentioned that "Occasional desecration of Hindu fanes took place... but such demonstrations were probably rare sops to the official conscience..."
H. M. Elliot considered him to be "better" than other invaders, indulging in "much less, wanton sacrifice of life than was freely indulged in by most of the ruthless bigots who have propagated the same faith elsewhere." He considers the "unwonted toleration" to have probably "arisen from the small number of the invading force, as well as from ignorance of civil institutions", however destruction of temples and civilian massacres still took place. Coercive conversion has been attributed to early historians such as Elliot, Cousens, Majumdar and Vaidya. They hold the view that the conversion of Sindh was necessitated. Qasim's numerical inferiority is said to explain any instances of apparent religious toleration, with the destruction of temples seen as a reflection of the more basic, religiously motivated intolerance. Voluntary conversion has been attributed to Thomas W. Arnold and modern Muslim historians such as Habib and Qureishi. They believe that the conquest was largely peaceful, and the conversion entirely so, and that the Arab forces enacted liberal, generous and tolerant policies. These historians mention the "praiseworthy conduct of Arab Muslims" and attribute their actions to a "superior civilizational complex". Various polemical perceptions of Islam, Hinduism and Buddhism are also reflected in this debate. Elliot perceived Islam as a religion of "terror, devastation, murder and rapine" where the conquering Arabs were characterized as "ruthless bigots" and "furious zealots" motivated by "plunder and proselytism". The period of Qasim's rule has been called by U.T. Thakkur "the darkest period in Sind history", with the records speaking of massive forced conversions, temple destruction, slaughters and genocides; the people of Sindh, described as inherently pacifist due to their Hindu/Buddhist religious inclinations, had to adjust to the conditions of "barbarian inroad". On one extreme, the Arab Muslims are seen as being compelled by religious stricture to conquer and forcibly convert Sindh, but on the other hand, they can be seen as being respectful and tolerant of non-Muslims as part of their religious duty, with conversion being facilitated by the vitality, equality and morals of the Islamic religion. Citations of towns taken either violently or bloodlessly, reading back into Arab Sindh information belonging to a later date and dubious accounts such as those of the forcible circumcision of Brahmins at Debal or Qasims consideration of Hindu sentiment in forbidding the slaughter of cows are used as examples for one particular view or the other. Some historians strike a middle ground, saying that Qasim was torn between the political expediency of making peace with the Hindus and Buddhists; having to call upon non-Muslims to serve under him as part of his mandate to administer newly conquered land; and orthodoxy by refraining from seeking the co-operation of "infidels". It is contended that Qasim may have struck a middle ground, conferring the status of Dhimmi upon the native Sindhis and permitting them to participate in his administration, but treating them as "noncitizens" (i.e. in the Khilafat, but not of it). Qasim's presence and rule was very brief. His conquest for the Umayyads brought Sindh into the orbit of the Muslim world. After the conquest of Sindh, Qasim adopted the Hanafi school of Sharia law which regarded polytheists such as Hindus, Buddhists and Jains as "dhimmis" and "People of the Book", allowing them religious freedom as long as they continued to pay the tax known as "jizya". This approach would prove critical to the way Muslim rulers ruled in India over the next centuries. During the troubles between the Abbasid Caliphate and the Umayyad Caliphate the local emirs shook off all allegiance to the caliphs and by the 10th century the region the Umayyad control was destroyed by Mahmud of Ghazni. The Abbasids took this opportunity to set up their own government in Sindh. The Soomra dynasty ruled Sindh as the functionary of the Abbasid Caliphate until the Siege of Baghdad (1258). Mansurah was the capital of the Soomra Dynasty. Coastal trade and a Muslim colony in Sindh allowed for cultural exchanges and the arrival of Sufi missionaries to expand Muslim influence. From Debal, which remained an important port until the 12th century, commercial links with the Persian Gulf and the Middle East intensified as Sindh became the "hinge of the Indian Ocean Trade and overland passway." Muhammad bin Qasim is often referred to as the first Pakistani according to Pakistan Studies curriculum. Muhammad Ali Jinnah also acclaimed Muhammad Bin Qasim and claimed that the Pakistan movement started when the first Muslim put his foot on the soil of Sindh, the Gateway of Islam in India. Yom-e Bab ul-Islam is observed in Pakistan, in honor of Muhammad bin Qasim. Port Qasim, Pakistan's second major port is named in honor of Muhammad bin Qasim. Bagh Ibne Qasim is the largest park in Karachi, Sindh, Pakistan named in honor of Muhammad bin Qasim. Ibn-e-Qasim Bagh Stadium, Multan is a multi-use stadium named after Muhammad bin Qasim. The Pakistan Naval Station Qasim, or PNS Qasim, is the major naval special operations base for the Amphibious Special Operations Forces in the Pakistan Navy named after Muhammad bin Qasim. Bin Qasim Town in Karachi is named after Muhammad bin Qasim. Muhammad bin Qasim Road/avenue in Karachi is named after Muhammad bin Qasim. Mohammad Bin Qasim Library in Sujawal, Thatta is named after Muhammad bin Qasim. Qasim Company in Pakistan Army is name after Muhammad bin Qasim. ^ Shoeb, Robina (2016). "Female Sufism in Pakistan: A Case Study of Bibi Pak Daman". Pakistan Vision. 17 (1): 229. But this version of the story is almost absent and not accepted by many historians, because Muhammad bin Qasim attacked Sindh to punish the then ruler of Sindh Raja Dahir who captured some Muslim women, and to release them he attacked Sindh. ^ The Indus River during this time flowed to the east of Nerun, but a 10th-century earthquake caused the river to change to its course. ^ a b c d e f The Chachnamah, An Ancient History of Sind, Giving the Hindu period down to the Arab Conquest. (1900). Translated from the Persian by Mirza Kalichbeg Fredunbeg. Karachi: Commissioners Press. ^ H. M. Elliot and John Dowson, The History of India, as Told by Its Own Historians, (London, 1867-1877), vol. 1, p. 203. "Kaksa took precedence in the army before all the nobles and commanders. He collected the revenue of the country and the treasury was placed under his seal. He assisted Muhammad ibn Qasim in all of his undertakings..."
^ Valour and Sacrifice: Famous Regiments of the Indian Army, page 152. ^ Medieval India by Stanly Lane-Poole, Pub 1970, Page 10. ^ Habib Tiliouine, Richard J. Estes, 2016, "The State of Social Progress of Islamic Societies", Springer, page 338. ^ John Powell, 2010, "Weapons & Warfare: Warfare : culture and concepts", Salem Press, page 884. ^ a b Nabeel Qureshi, 2016, "Answering Jihad and Seeking Allah", page: see "Question 6"
^ Bjørn Olav Utvik, 2006, "The Pious Road to Development: Islamist Economics in Egypt", Hurst & Company, page 101. ^ The French scholar Gustave Le Bon (the author of La civilisation des Arabes) writes "the incidence of taxation fell more heavily on a Muslim than a non-Muslim." Mun'im Sirry (2014), Scriptural Polemics: The Qur'an and Other Religions, p.179. Oxford University Press. ISBN 978-0199359363. ^ a b Iqtidar Hisain Siddiqui, 2010, Indo-Persian historiography up to thirteenth century, Primum Books, Delhi. ^ Glenn, H. Patrick (2007). Legal Traditions of the World. Oxford University Press. pp. 218–219. ^ Clinton Bennett (2005). Muslims and Modernity: An Introduction to the Issues and Debates. Continuum International Publishing Group. p. 163. ISBN 082645481X. Retrieved 7 July 2012. ^ Manan Ahmed Asif (2016). A Book of Conquest. Harvard University Press. pp. 111–112. ISBN 978-0-674-97243-8. ^ a b Mohammad Yunus, Aradhana Parmar, 2003, "South Asia: A Historical Narrative", Oxford University Press, page 123. ^ André Wink (2002). Al-Hind, the Making of the Indo-Islamic World: Early Medieval India and the Expansion of Islam 7Th-11th Centuries. BRILL. pp. 207–. ISBN 0-391-04173-8. ^ BALOUCH, AKHTAR (16 September 2015). "Muhammad Bin Qasim: Predator or preacher?". DAWN. Retrieved 10 January 2017. ^ Iqtidar Husain Siddiqi (2010). "Indo-Persian Historiography Up to the Thirteenth Century". Primus Books. p. 32. ISBN 9788190891806. ^ A Book of Conquest, p. 169, authored by Manan Ahmed Asif, published by Oxford University Press, 19-Sep-2016. ^ a b Markovits, Claude The Global World of Indian Merchants, 1750-1947: Traders of Sind from Bukhara to Panama, Cambridge University Press, June 22, 2000, ISBN 0-521-62285-9, pg. 34. ^ Akbar, M.J, The Shade of Swords, Routledge (UK), December 1, 2003, ISBN 0-415-32814-4, pg. 102. ^ Federal Research Division. "Pakistan a Country Study", Kessinger Publishing, June 1, 2004, ISBN 1-4191-3994-0 pg.45. ^ "History books contain major distortions". Daily Times. ^ APP (November 7, 2003). "KARACHI: Babul Islam day observed". Dawn. Retrieved May 20, 2012. The Chachnamah, An Ancient History of Sind, Giving the Hindu period down to the Arab Conquest. (1900). Translated from the Persian by Mirza Kalichbeg Fredunbeg. Karachi: Commissioners Press.